We have three action items related to the rallies this week, and we need all hands on deck, so please read through all three items! 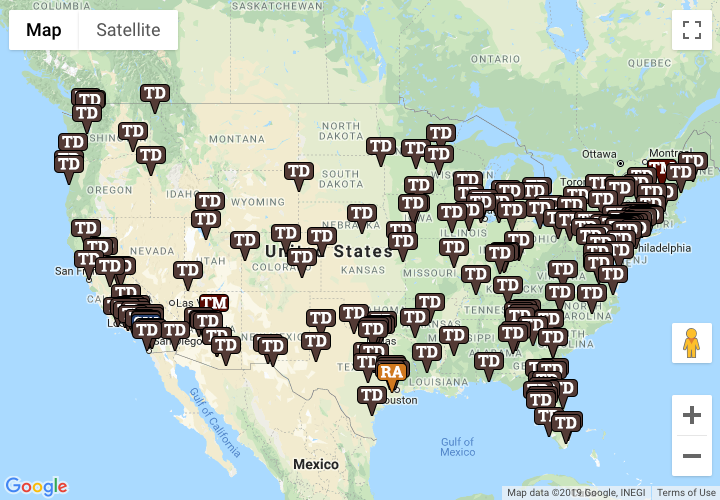 There are now over 300 Stop Socialism Choose Freedom rallies planned and we can reach our goal of 500 rallies nationwide with your help by either organizing a rally and/or sharing information about the rallies on your social media and with your friends. If you’re thinking that it’s too late to organize a rally – think again! You can organize a very simple sign waving rally in almost no time. All you really need for that is to set the day and time, pick a busy intersection, make a few signs on poster board, and invite a few friends to join you. That’s it! Know this: a rally can literally be two people sign waving! But, if you want to do a larger rally with a formal program, you can still get that done too! It will just take a little more planning and time to organize, but we are here to help you! Please share the following graphics and text on your social media accounts. As you know, the mainstream media isn’t going to help us promote Stop Socialism Choose Freedom rallies the way they promoted the anti-gun student walkouts or the anti-Trump “women’s” marches. It’s up to us to use word of mouth to let other patriotic Americans know about this opportunity to rally for freedom. Already shared these specific posts? That’s ok! You can share them again and just edit the text in the post to say something like, “I already shared this, but am sharing again to reach more people! 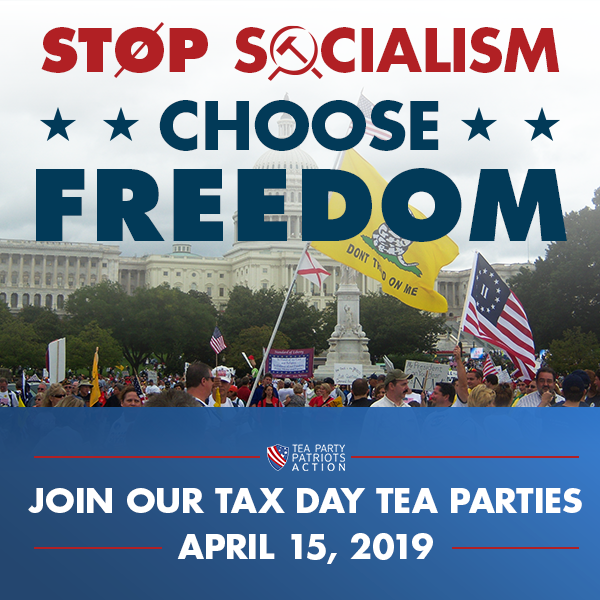 Our freedom is too important to stay home on April 15th!” Make sure to use the hashtag #StopSocialismChooseFreedom on every social media post about the rally! You can either download the embedded images and then upload them yourself (as well as copying the included text and pasting it into your post), or just click the buttons below to share them directly to your social media accounts. Ask others (by text message or email) to post on social media about the rallies too. Here is sample text you can send your friends and family. All you need to do is copy and paste the paragraphs below into a text message or email, whichever works best for you. 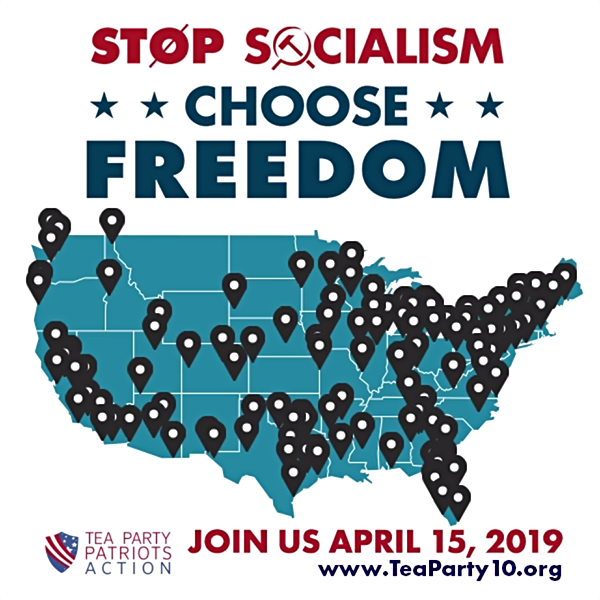 Hi, I’m trying to spread the word about the Stop Socialism Choose Freedom rallies happening across the country on April 15th. Will you do me a favor? Will you help get the word out on social media? If you can help, just post the following text on your social media accounts. Thank you!! 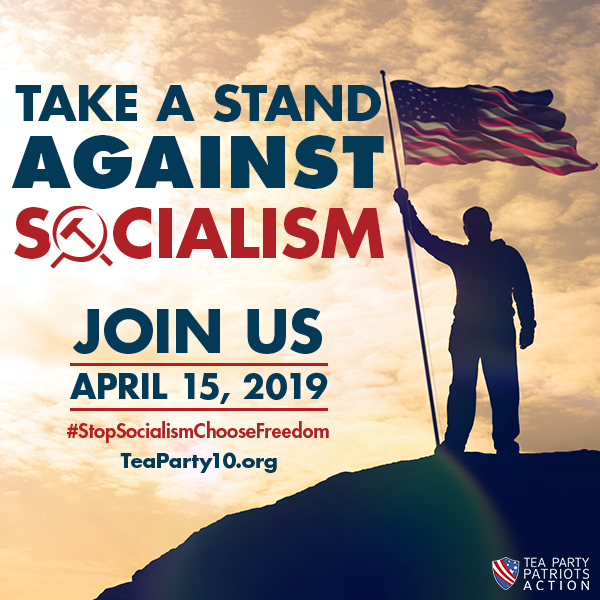 Join your fellow Americans as we stand up for freedom and against socialism at nationwide rallies on April 15th! To find a rally near you or to sign up to host a rally (a rally can be a simple sign waving event or an event with a formal program), just go to www.teaparty10.com. Let’s work together to #StopSocialismChooseFreedom! Launched the how-to guide for April 15th rally organizers! Sign up to get your copy!